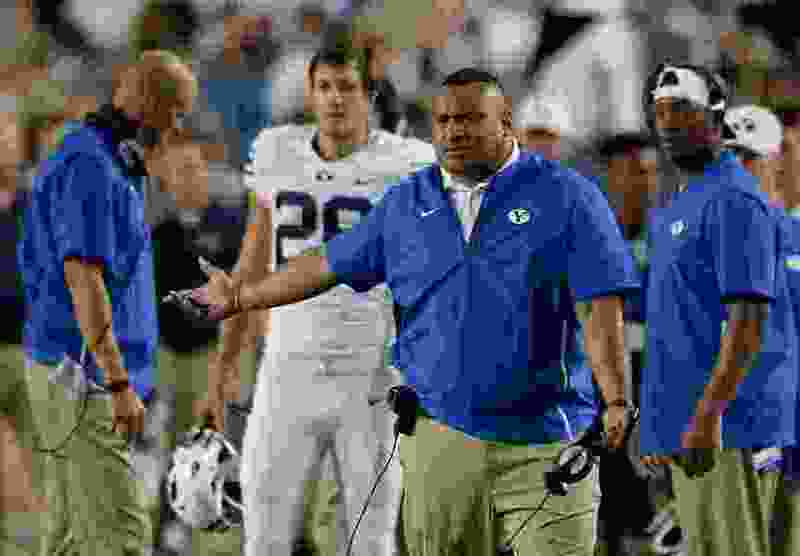 (Francisco Kjolseth | The Salt Lake Tribune) BYU head coach Kalani Sitake signed 18 new football recruits the past few months, but national recruiting websites aren't impressed, ranking the class anywhere between No. 71 and No. 99 in the country. The college football recruiting websites have mostly finalized their team rankings for the class of 2019 recruits, and the numbers don’t look good for BYU. The 18-player class that head coach Kalani Sitake added to his program — four signed last week, 14 signed in December — is ranked No. 79 in the country by 247sports.com, No. 99 by Rivals.com and No. 71 by ESPN.com. On the surface, it looks like another subpar class for the program, which has been a trend the past half-dozen or so years. That’s especially true if you put any stock in the recruiting rankings and the star system that’s been in vogue for two or three decades now. But as BYU fans are well aware, the rankings mean little when applied to the Cougars because of the school’s missionary program. For instance, of the 18 new signees, nine are expected to go on church missions before actually enrolling, including four-star quarterback Jacob Conover of Chandler, Ariz. In fact, Conover has already departed on his mission to Paraguay. Of the four who signed last week — Cade Albright, Luc Andrada, Javelle Brown and Dimitri Gallow — Albright is the only February signee who will not be available this fall, due to missionary service. The national rankings don’t take into account guys who will be leaving on missions — or guys who will be returning. That number is close to 20, and includes the likes of linebacker Chaz Ah You, defensive tackle Freddy Livai, offensive lineman Caden Haws and kicker Jake Oldroyd. Schools aren’t allowed to announce their preferred walk-ons, but BYU obviously made a concerted effort to get commitments from plenty of those in the days leading up to the beginning of February’s signing period. And Sitake hinted in his news conference — without naming names — that some of those PWOs could help the Cougars this fall, like receiver Dax Milne did. • Conference play was not the antidote for the men’s volleyball team’s puzzling slump last week. The Cougars opened MPSF play on the road with losses at No. 5 Pepperdine and No. 4 UCLA, despite continued outstanding play from opposite hitter Gabi Garcia Fernandez. The No. 8 Cougars (4-4) return to Smith Fieldhouse for the first time since Jan. 12 this week and will host Concordia Irvine on Thursday and No. 14 USC on Saturday. * BYU’s baseball team begins its season on Friday against Northwestern in Mesa, Ariz., with a three-game series that concludes on Saturday. The Cougars will meet California on Monday. Hopes are high that coach Mike Littlewood’s team can turn it around after going 22-28 last year and failing to make the WCC tournament. • Having gone 1-3 last weekend in Mexico, the BYU softball team will play in the Boyd Gaming Rebel Classic in Las Vegas this weekend. The Cougars will face Fordham, Hawaii, UC Davis, Georgetown and UTEP — teams from five different conferences — in the three-day event. • Coach Jeff Judkins’ BYU women’s basketball team recovered from a devastating loss to Saint Mary’s on Kids Day last Thursday and beat Pacific easily on Saturday. The Cougars (18-6, 10-3) are at Portland on Thursday night before the big showdown with league-leading Gonzaga on Saturday in Spokane. • The much-improved BYU gymnastics team, ranked No. 20 in the country, hosts No. 10 Boise State on Friday at Smith Fieldhouse in Provo. The Cougars scored a 196.425 to win a quad meet at Air Force last weekend, out-pointing Air Force, Springfield and Seattle Pacific. Freshman Helody Cyrene earned MRGC Bars Specialist of the Week.